Homeowner shares the bounty of her extensive plantings with family, friends, and beyond. 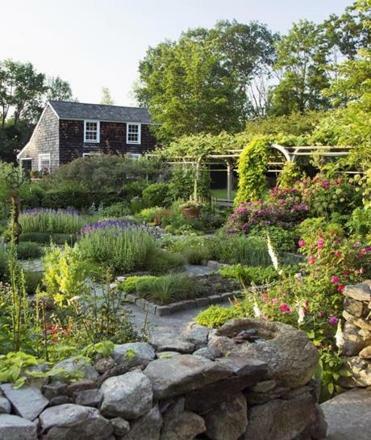 The Walled Garden, with its plots of vegetables and herbs, is the landscape centerpiece of Maureen and Michael Ruettgers’s Carlisle property: Gardens at the Clock Barn. Maureen and her husband, Michael, bought the Carlisle property, which they call Gardens at the Clock Barn, in 1980. Its saltbox farmhouse, built in the early 1700s by Jonathan Blood, who operated the area’s first sawmill, sits on 3.5 acres. In the 1930s, James Patch purchased the property and, as part of the war effort, grew digitalis. Apart from a stand of mature oaks, the land was mostly open field, but given its fertile history, greenhouse, and other outbuildings, the Ruettgerses were immediately drawn in. In the early days, the garden was very much a DIY project. Abby has vivid memories of her dad manning the rototiller on weekends. Her grandfather, who still visits daily, built trellises, an arbor, a drying rack, a tree fort, and benches. Maureen’s first project was to carve out an herb garden. She credits inspiration for its beginnings to her mentor, Mary H. Milligan, whom she met through the New England unit of The Herb Society of America. The walled garden, a grid-like arrangement of beds separated by stone-dust paths, is the focal point, where spiky alliums border plots of vegetables and herbs. 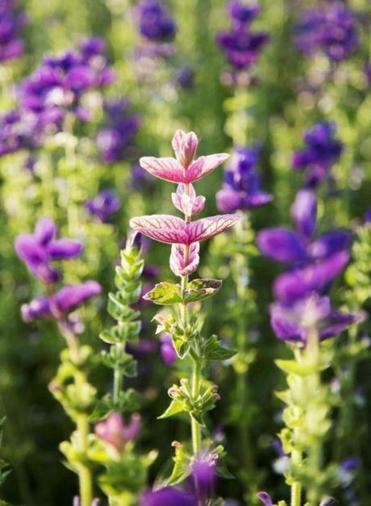 Most notable is the large crop of ‘Black and Blue’ salvia (a huge attractor of hummingbirds), which gets swapped for calendulas and nasturtiums come fall. An armillary sphere sits at the walled garden’s center. There is also a pair of reflecting pools filled with black-dyed water, inspired by Maureen’s visit to Les Quatre Vents gardens in Quebec. The original greenhouse, restored and enlarged, sits at one end of the walled garden. It’s where Guy Doran, a fourth-generation greenhouse grower who came to work with the Ruettgerses about seven years ago, starts the vegetable and flower seedlings. Nearby is the chicken coop, where a handful of hens lays eggs daily. The flock includes Boss Lady, who’s still going strong at 8, not to be outdone by young Mrs. Cabot and Mrs. Lodge. Beyond are more vegetable beds, as well as cutting gardens, where Doran grows flowers for Abby to sell at her South End vintage kitchen shop, Farm & Fable, and a 40-foot trellis supporting a double row of sweet peas in a variety of colors. Then there’s the apple orchard, with a few peach trees sprinkled in. Canning, pickling, and preserving are a way of life here. Michael makes chutney and dilly beans, Maureen infuses oil and vinegar, Doran’s wife makes grape jelly, and the whole gang gets together to press apple cider. As for surplus produce, the family regularly donates it to the Lexington Interfaith Food Pantry. On the other side of the property, Maureen created a woodland garden around that original stand of oak trees. There are paths lined with hostas and other shade-loving plants, like jack-in-the-pulpits, bloodroot, and trillium, culminating with a koi pond. Finally, the most recent addition to this fecund universe is the secret garden. Enclosed by a bamboo Japanese-style fence, it’s accessible only from the home’s back door and serves as a special place for Maureen to host tea parties for her granddaughter (and her dolls).